I was working on a short one minute movie. Just want to tell you how I achieved this. The story of my mini movie is my friend plays as a student who does a assignment and drops it on the ground. Later having his friend find it on the ground and give it back to him. For comedy I had my friend throw it out in the end. I started this task by sketching out what my friends were going to do in the movie. Later filming it for a couple of days, due to schedules for my two friends. Once I got all of my footage I put it into a software called Avid Media Composer. 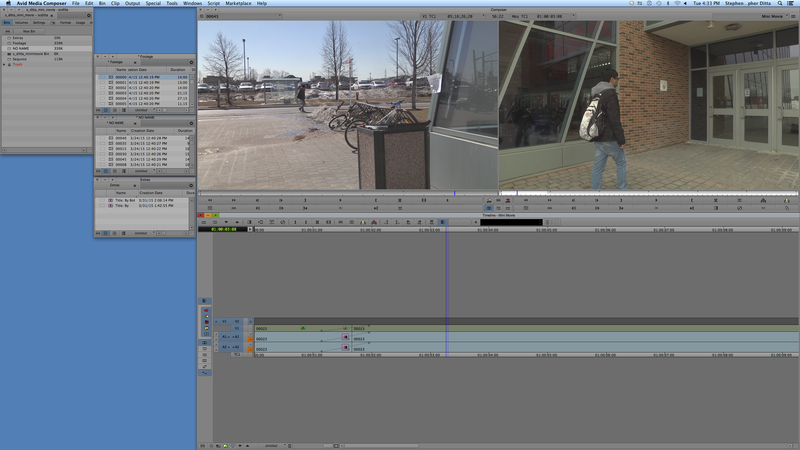 I Gathering all the shots and edited the material splicing what I liked and putting it into my sequence. The one problem I found would be that due to filming on separate days the lighting looks more dull near the end. Other than that It was fun putting this assignment together.